Click here to read previous TAST posts. I felt these results were very promising. TAST expanded its restaurant chain from 28 to 36 outlets during the year, which lifted revenue by 28% and operating profit by 41%. I was impressed cash generated from operations came to £5,308k versus a reported operating profit of £2,626k. The full cash-flow reconciliation was not published within these preliminary numbers, so I can only surmise TAST enjoyed a very favourable working-capital movement. (I will double-check the full annual report to discover what occurred). 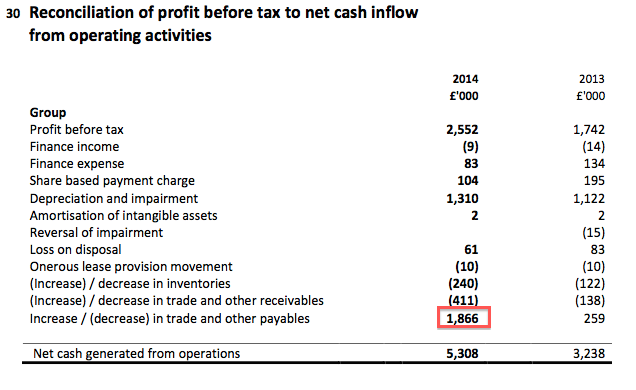 It’s also worth noting TAST has not paid any cash taxes during the last three years, despite the income statement recording an aggregate £1.1m tax charge against reported earnings. While I confess I do not entirely understand the tax rules involved, a very similar tax situation occurred at sister chain Prezzo (PRZ) — and this deferral of cash taxes provided sizeable funds for PRZ to open new restaurants. Anyway, TAST’s working-capital movement and lack of tax payable meant it could spend a significant £6,378k on new (and existing) restaurants during 2014. During the last five years, TAST’s estate has increased by 25 outlets after total capital expenditure of £19,658k. Assuming depreciation and amortisation of £4,290k is a proxy for expenditure on existing sites, I reckon the average capital cost of each new outlet has been £615k. For 2013, the same five-year calculation would have given £609k and for 2012 the figure came to £646k. So I am pleased TAST’s new sites are not costing any more to open. TAST took on debt of £1m — with the facility to add another £3m — the other year. It was a surprising move, as sister chain PRZ had operated without any debt during its lifetime and had instead raised extra cash from shareholders to expand. But with debt costs low at present, perhaps TAST’s decision to borrow money currently makes more sense. …to grow its estate to 200-plus outlets. 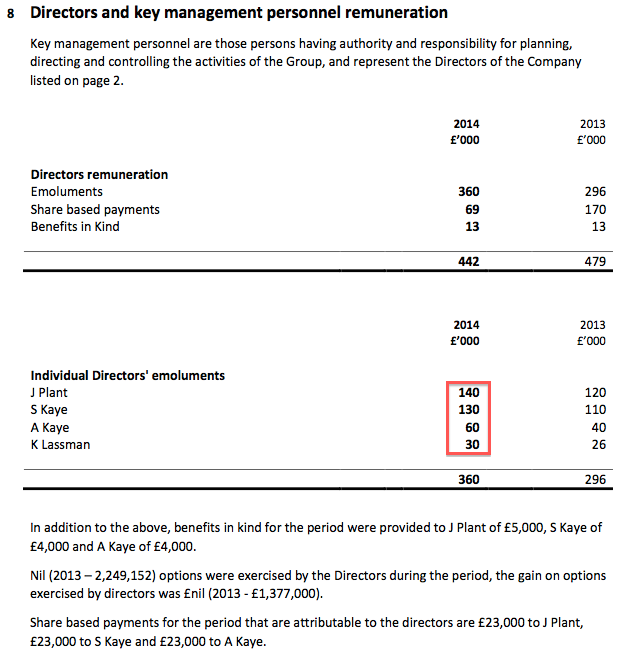 But these results showed TAST paying off £250k of its debt during 2014. If TAST was to go the debt route to expand, I’d assumed the group would now be drawing down some of its £3m unused facility to open extra sites. 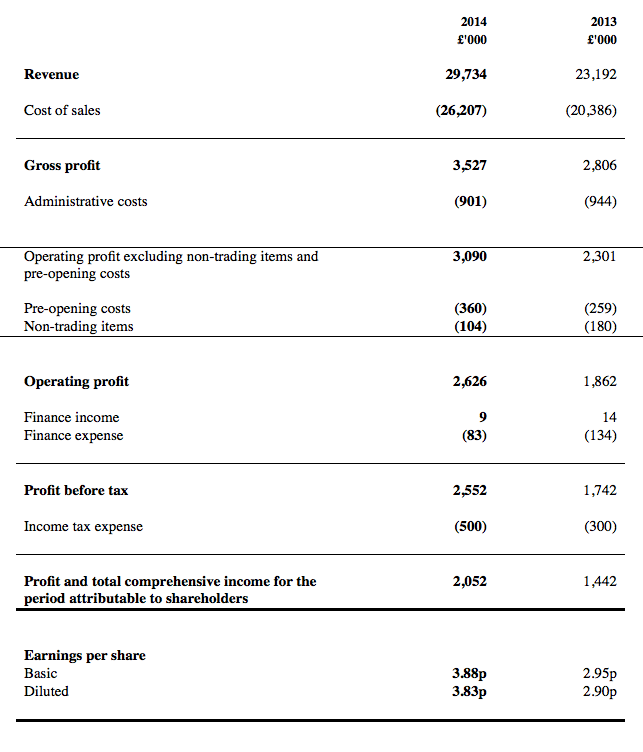 Looking at TAST’s super cash flow in these results, the optimist in me believes that perhaps — perhaps! — the firm may not actually need hefty extra financing from debt or share placings to become ‘the next PRZ’. I would be amazed — and extremely pleased! — if that proved to be the case. TAST confirmed it had opened a further three sites during 2015 to take its estate to 39 locations. I am also encouraged the firm claimed: “The rate of development will accelerate in the medium term”. I am hopeful the rate can soon top 10 sites a year — PRZ in its heyday was opening 20-plus sites a year. TAST’s family management has already built and sold two multi-bagger restaurant chains (ASK Central for £223m in 2004 and PRZ for £304m in 2015) and I see no reason why they cannot complete the hat-trick with TAST. Prior to these results I spent a lot of time re-jigging my long-term projections for TAST’s expansion. However, I gradually realised the number of unknowns was making my extrapolation quite unreliable. In particular, I looked at PRZ’s financial history for comparison and I noted its expansion was partly funded by the aforementioned deferred tax payments and some very favourable working-capital movements — two items that I found difficult to predict for TAST. Plus, I wasn’t sure (and I’m still not sure) whether TAST will expand using extra debt, extra equity or neither. Predicting potential margin improvements for TAST was another headache. PRZ was acquired earlier this year for £304m when it operated with 245 restaurants. Back in June 2004, PRZ had 35 outlets — comparable to TAST’s 36 at the end of 2014. So if TAST simply follows the success of PRZ, then the next 10 years could see TAST’s £75m market cap become £304m — or advance 4.1-fold or 15% a year. (Subtract PRZ’s £33m freehold assets from its final £304m market cap, and TAST’s market cap could grow 3.6-fold or 14% a year. (TAST does not own any freeholds)). TAST’s trailing P/E is 36 — so the downside could be considerable if a setback were to occur and/or the expansion history of PRZ cannot be replicated. Ive eaten at the wildwood restaurant a few times and the food is good! Not tried the Dim sum chain. The value in me is having trouble getting past the PE ratio. If it ever pulls back I would happily grab a few. Yes, the P/E is high — so this stock is an exception in my portfolio. But there is an opportunity here for sizeable growth from a management team that has delivered such sizeable growth twice before. That said, P/E for PRZ did get to about 9 at the market bottom of 2009 when the shares were c20p. Sure enough, there was a super £1,866k increase in the cash owed to trade and other creditors. I suspect that figure will reverse somewhat during 2015, but if TAST can keep suppliers (and landlords?) waiting a little longer, the cash on hand can be used to develop further outlets. These salaries do not appear grandiose to me given the size of the company. Adam Kaye is a non-exec, and in normal circumstances a £60k fee for a typical non-exec would be excessive for a small AIM business. But I get the impression Mr Kaye works in a semi-executive capacity and obtaining his talents for £60k a year seems good value in my view. I will need to keep an eye on possible future share dilution. Some 2,042k options were granted in the year and the total option count now stands at 3,114k. Add on 1,800k of ‘A’ shares and there could be an extra 4,914k shares in issue at some point. The year-end share count was 53,048k, so the potential dilution is a significant 9.3%. “Tasty plc today announces the award and acceptance of 600,000 ‘B’ ordinary shares in a subsidiary company of the Group (“B Shares“) to Jonny Plant, Joint Chief Executive Officer of the Company, on 1 May 2015. The B Shares may be exchanged into ordinary shares of 10 pence each in Tasty plc (“Ordinary Shares“), subject to the share price of the Company trading above 200p for 15 consecutive trading days or more. 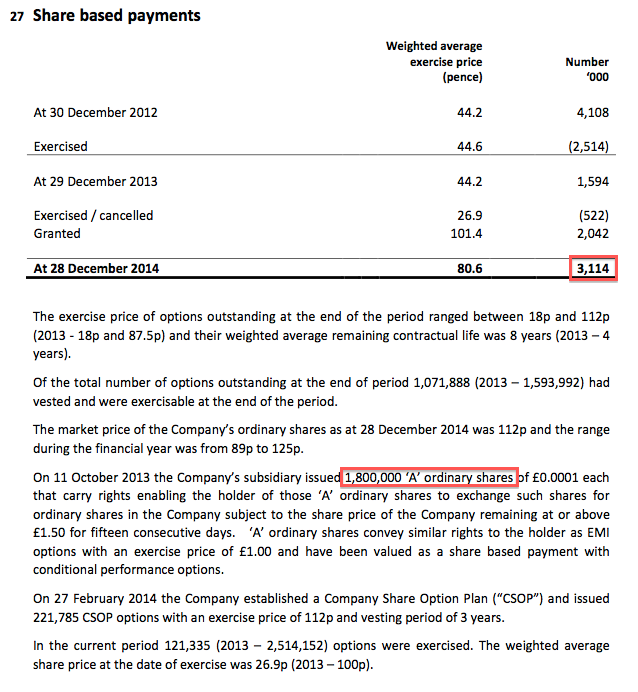 The B Shares have an exercise price into Ordinary Shares of 120p per share. The benefit of holding a B Share is similar to the benefit of holding an EMI Option. I am not really a fan of options, as they can be granted on very generous terms and ordinary shareholders can find themselves diluted over time. But as options go, the executive ones granted by TAST are quite appealing. You see, their terms all include a specified target price in which the shares much reach before the executive can cash in. That makes things nice and simple for all concerned. Build the business to get the share price to the target, and the director gets the extra shares and us shareholders should be quite happy too with the price having advanced. From memory, past executive TAST options (or equivalent) were issued when the shares were around 50p and had a target price of 100p, and were issued when the shares were around 100p and had a target price of 150p. And here we are with the shares at 135p and a target price of 200p. I am pleased the board reckons 200p is achievable. “Some 2,042k options were granted in the year and the total option count now stands at 3,114k. Add on 1,800k of ‘A’ shares and there could be an extra 4,914k shares in issue at some point. The year-end share count was 53,048k, so the potential dilution is a significant 9.3%”. Potential dilution now is 3,114k options plus 1,800k ‘A’ shares plus 600k ‘B’ shares equals 5,514k extra shares — equivalent to 10.4% of the year-end share count. So the option (and equivalent) count is becoming substantial now… but if (when?) the price does hit 200p then I doubt there will be many complaints for shareholders. “Tasty plc is pleased to announce that it has renewed and extended its existing facility. The amended facility is for £8 million, consisting of a £3 million revolving bank facility and a £5 million term loan. Both the revolving facility and the term loan are available to the Company for 5 years. The debt provider is Barclays plc. These amended facilities appear promising. I have written in my TAST Blog posts that the company looks likely to use debt — rather than equity as per ex-sister firm Prezzo (PRZ) — to fund its expansion. Clearly Barclays is happy with TAST’s books and plans, and has increased the term loan from what was £0.75m to £5m and has also extended the borrowing period from 3 to 5 years. (The £3m revolving facility from Barclays remains the same, but is now over 5 years as well.). My sums indicate TAST was paying 6.2% interest on the term loan during 2014, while the last annual report revealed TAST was paying a 1.48% charge on the £3m revolving facility that had yet to be utilised. Anyway, £8m is a lot of extra firepower and reminds me of the situation/size of PRZ back in mid-2004, when the sister chain had 35 outlets and its operating profits were running at £2m. PRZ then raised £9m from investors to kick-start its expansion plan and reached 98 sites by the end of 2006. TAST’s 2014 results revealed 36 outlets at year-end and a £2.6m operating profit. So there’s still all to play for here in terms of TAST becoming the next PRZ, at least in my view. TAST should have interim results out later this month. This is an exciting move and announced just ahead of half year results. With the depressed market TAST has held up well and the market likes this news. Yes, it has held up relatively well and fingers crossed for the future. There is some uncertainty with the new Living Wage and how that will affect TAST’s London-centric chain and margins, but I guess all restaurants in the capital will be in the same boat. Very impressive results although the store openings have grown the rate of growth is still very measured. Maybe with the latest finance deal we will see an acceleration next year. The Profit growth seems to be outstripping the revenues which is nice to see.